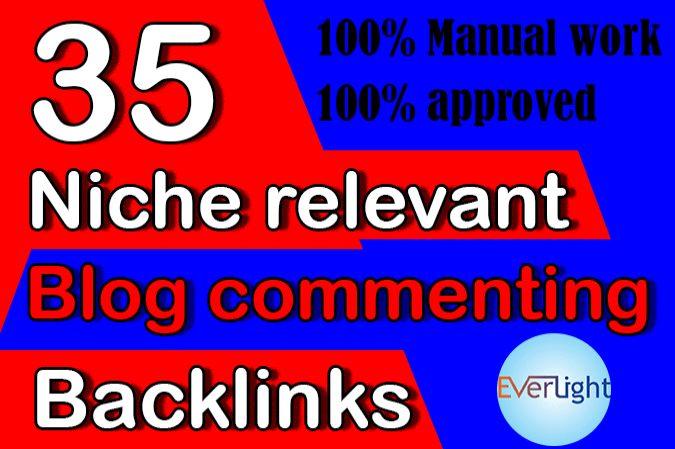 Theme based relevant industry related Niche Blog commenting service, now get 35 Niche based relevant quality backlinks from quality pages from real domains to boost your SERP for only 10 bucks. Comments will be on high quality excellent blogs similar to your keywords. All approved ones and live , No spammed pages, All well indexed pages, wide range of diversity, 100% SERP will be improved after using this service. If you would like them quite thirtyfive , please choose EXTRAS consequently. We don't use any code for postings comments, all work is finished manually. Please don't send us any universal resource locator (URL) having Adult/Gambling, Dating, illegal Pharmacy material. Please send us three keywords or a lot of for diversity. Detailed report are provided at the time of delivery. It is a nice GIG for ranking your web site on prime of prime search engines. So, why wait? Hurry Up Grab this offer before it gets sold-out out.